Peanut butter cookies are my favorite cookie, but they can be a little booooring. Why not make them about a gazillion times prettier by rolling them in sprinkles? 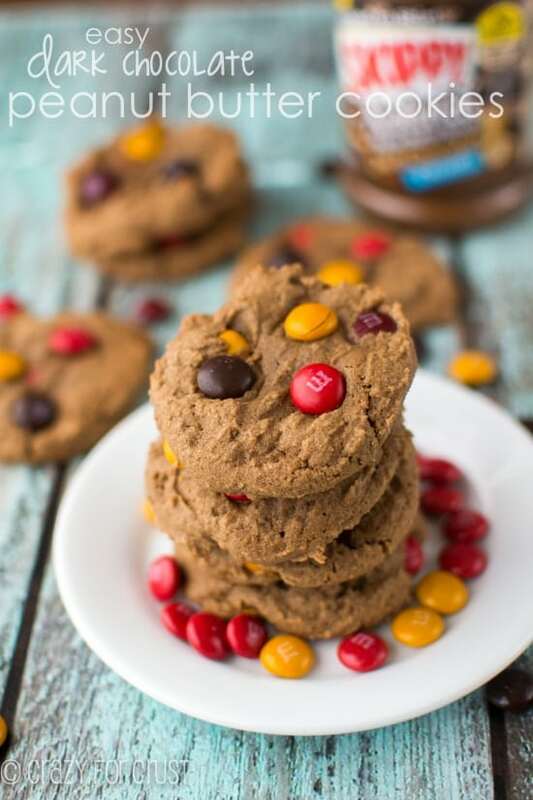 These Peanut Butter Sprinkle Cookies are easy, with only 6 ingredients. And they’re gluten-free! I do this to myself every year. I proclaim that we’re going to make it an easy summer. No over scheduling. No craziness. We’re going to be lazy and have picnics in the living room and swim when we want and eat ice cream for breakfast and go on random day trips and road trips and to the beach. And then May tuns into June and the threat of school ending brings me back to my senses. I start to sweat and stress, thinking about the long stretch of school-free days ahead of me. I start making plans, and before I know it, every week has a purpose, a schedule. I’m a full-time working mom without child care. My daughter always complains that she wants time to relax, and when that 5 minutes are up she starts complaining about how bored she is. When we go anywhere with a drive longer than 5 minutes she talks about how loooooooooong the drive is and complains I didn’t download her a movie. The result? Camps and playdates and trips galore. In fact, today is Jordan’s last day of school. And she doesn’t get a break until the 4th of July. Speaking of the 4th, it’s right around the corner. 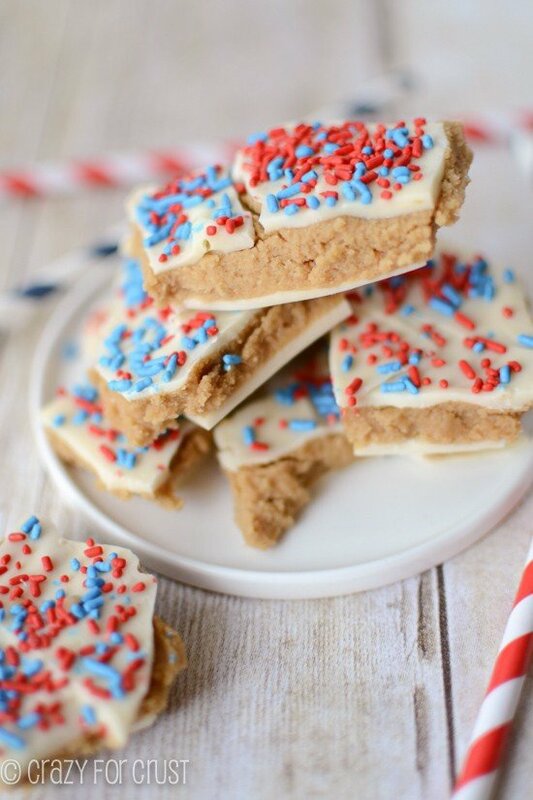 And you can’t celebrate Independence day without some red, white, and blue dessert. It’s like, against the law. Or it should be. Or something. 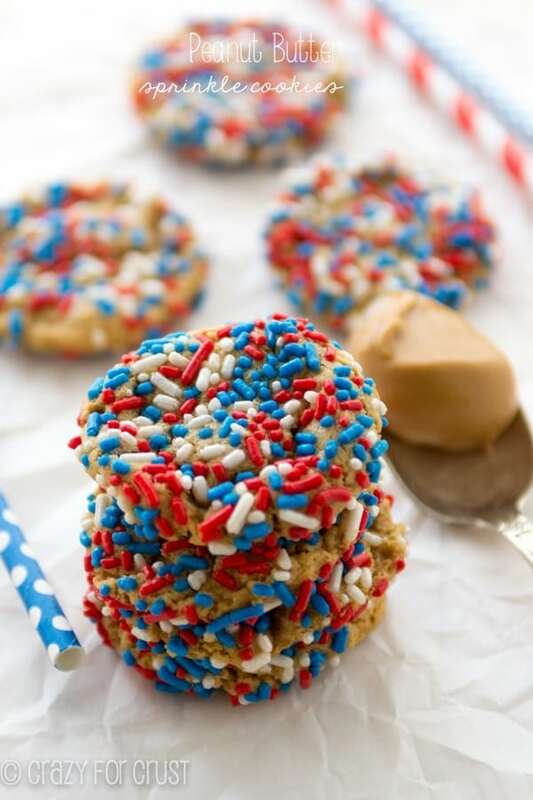 So why not dress up your favorite peanut butter cookies in red, white, and blue sprinkles? These are most definitely not boring, that’s for sure! 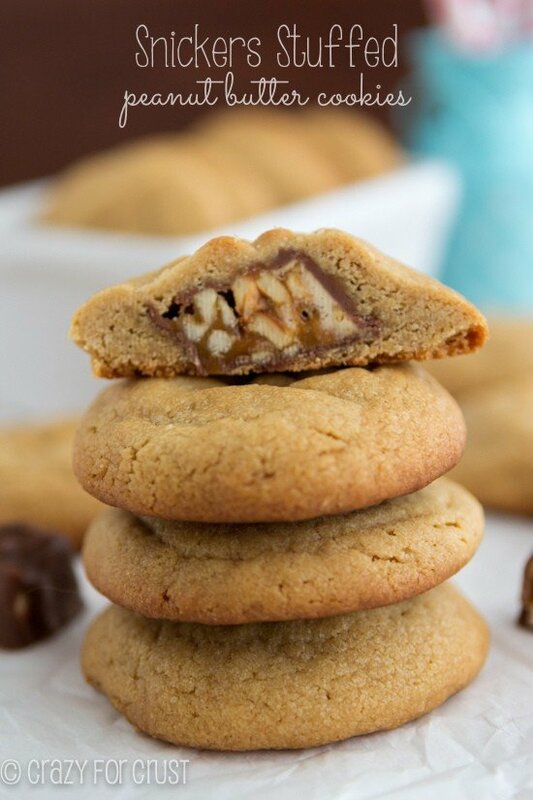 These cookies are my favorite peanut butter cookie. It’s the “easy” recipe, one you’ve probably seen floating around the internet forever. Everyone has their favorite combination, but mine includes peanut butter, brown and white sugar, an egg, and some baking soda. And sprinkles!!! And guess what? They don’t have to just be for the 4th. Why not use rainbow sprinkles? My two favorite sprinkle combos are rainbow and red, white, and blue. In fact, I love red, white, and blue food. I’m kind of starry eyed over it. The taste EXPLODES with peanut butter flavor because they have no flour. And yes, it’s like magic, that you can have cookies with no flour. No flour means they are gluten-free. It’s a win-win! And I checked: the sprinkles I use (Cake Mate brand, under the Betty Crocker umbrella) are considered gluten-free. If you’re concerned, be sure to google your favorite sprinkles. Let’s talk about peanut butter. I love using Skippy Naturals. It’s my go-to brand. (Not sponsored, just true.) I’ve used Skippy since I was a kid, and the Naturals line is just so good. It’s a no stir peanut butter that’s more natural than it’s regular counterpart. Most mainstream brands have a naturals line these days. You can use your favorite peanut butter (although I’ve never tried these with a true, need-to-stir natural brand). If you’re using a reduced-fat peanut butter, you may need to adjust the sugar. In my experience, the reduced-fat peanut butters add more sugar, so they’ll be extra sweet. These cookies come together with one bowl, no chilling time, and you can stir them by hand. Like I said – magical. The dough is sticky, so rolling them in sprinkles is a messy process, but worth it. Once you bake them the sprinkles add a little crunch that makes them SO good! The best part is that you can make them for the 4th of July. Or use rainbow sprinkles for a birthday. Or a random Thursday. These are my FAVORITE peanut butter cookies. They’ll be yours too, I’m sure! 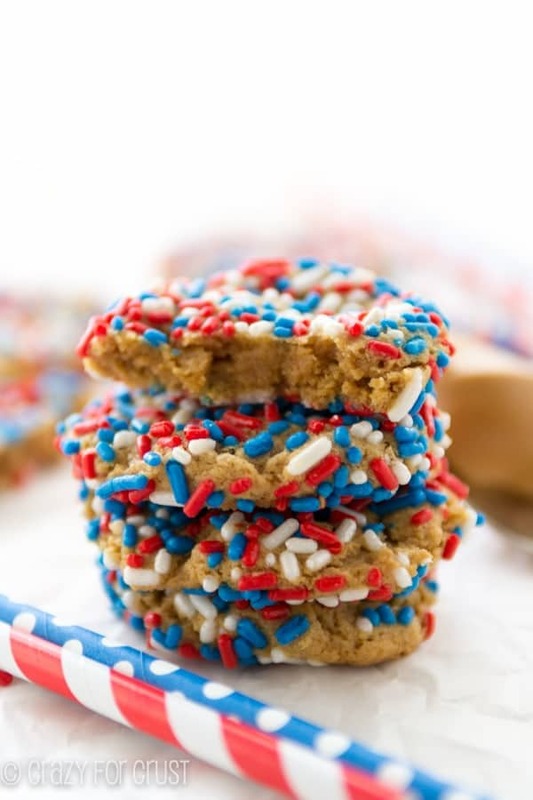 A simple, gluten-free peanut butter cookie rolled in sprinkles! Jazz them up for any holiday! Preheat oven to 350°F. Line two cookie sheets with Silpats or parchment paper. Stir peanut butter, egg, sugars, and baking soda together in a large bowl. You can use a wooden spoon or a hand mixer. Place your sprinkles in a shallow bowl. 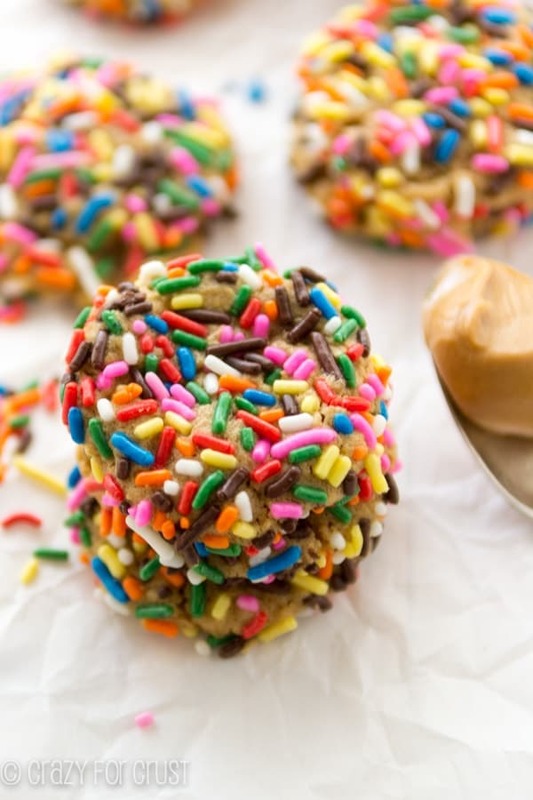 Scoop balls of cookie dough and roll them in the sprinkles, coating completely. I used a 1 tablespoon cookie scoop for this step. The dough is very sticky and it helps to dampen your hands slightly before rolling. Place each cookie dough ball 2” apart on the prepared cookie sheets and flatten slightly with the palm of your hand. Bake for 7-9 minutes. Cool before removing from cookie sheets. Note: these cookies can be crumbly so be careful when picking them up or packing them in lunches. Find more COOKIES on my pin board! 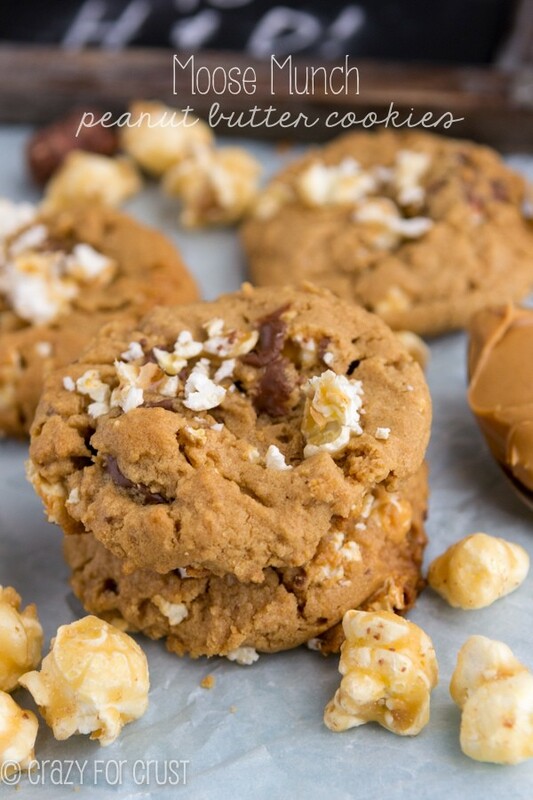 Follow Crazy for Crust’s board Crazy for Cookies on Pinterest.